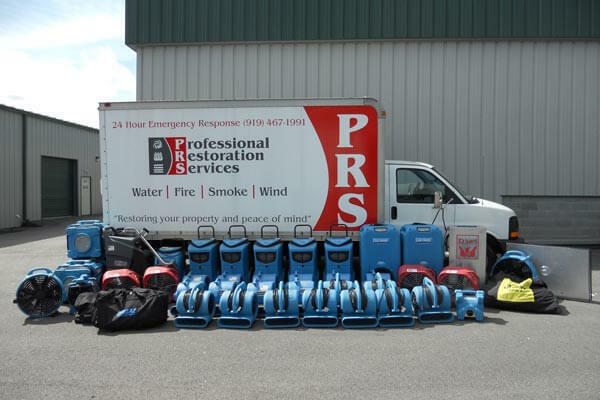 Professional Restoration Services provides emergency services throughout Raleigh, North Carolina and surrounding areas. We pride ourselves on quick response, quality craftsmanship and overall professionalism within the restoration community. At PRS we believe that our success rest solely on our ability to repair your loss in a timely manner using the most up to date products and processes in the restoration industry to insure your complete satisfaction in our work. In our efforts to succeed our employees receive constant training and grow on a continual basis in overall restoration knowledge. It is this relentless pursuit of knowledge, excellence and professionalism that serves as the foundation of our business. PRS has the ability to dispatch an immediate response team to your location 24 hours a day, 7 days a week, 365 days a year. You can be confident that we’ll be there when you need us the most. This is just to tell you how much I appreciated the quick response PRS gave to my call when my hot water heat leaked. As a result, the time required to dry out my carpet and make my house livable again was shorted by several days. Your staff is knowledgeable and professional. They made sure I knew what was going on and how long things would take. The appointments made to check on the carpet were on time and completed in an efficient manner. What could have been a very costly disaster was lessened by PRS and the services you gave. We cannot thank you and your company enough for making our disaster an easy transition. I believe that our prayers were answered when my insurance company sent you over to take care of the water and mold damage that occurred. We have been back in our home for over a month now and absolutely love it; more than we did when we first bought. With our new renovation and the advice of the contractors that were recommended from PRS; this was a hassle free project on our end. Everything was done above standard 100%. Again thank you very much for making our house a home once again. – Todd & Jessica G.
This is a quick note to thank you for recommending Professional Restoration Services to me when my home experienced a bit of water damage this past July. I was impressed with their work, their thoroughness, and diligence. It turned out that the water damage was more than I originally anticipated, but PRS took care of everything – and I would not have found them without your recommendation. Thank you for the great work on our house. We are grateful and amazed at how quickly your team worked. All of the staff was friendly, courteous and genuinely nice! I just wanted to let you know that we used Kevin Reinert / Professional Restoration Services to repair the bathroom and other areas of the house that had sustained water damage. They completed their work last Friday, and we are pleased with everything. Thank you for recommending them to us–we had a good experience.